Hydraulic Rear Axle: Allows for raising and lowering your Dura-Grader to easily transport or feather material. 4″ rugged tube steel design: The rugged 1/4″ thick tube steel design will give you years of dependable service and requires almost no maintenance. High carbon edges: Every Dura-Grader is equipped with the same cutting edges that are found on commercial motor graders. Reversible skid shoes: The CATP Series comes with 1 3⁄4″ thick solid steel skid shoes that easily bolt on. Simply flip the skid shoes to extend their life. 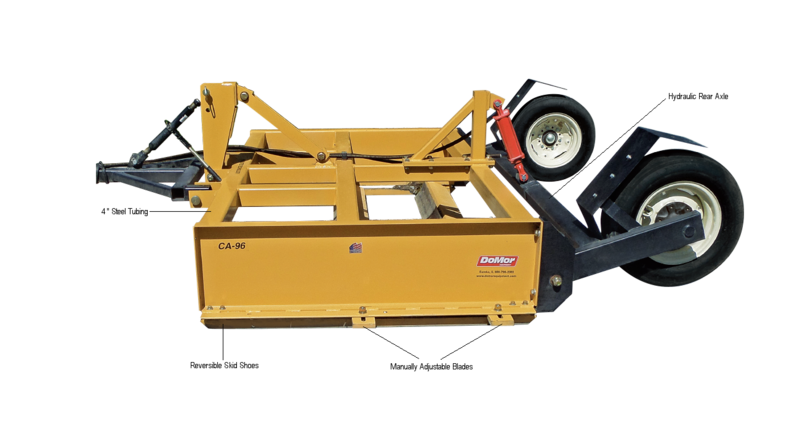 3 point compatible: By removing the tongue unit of the CATP, this grader quickly becomes compatible with your tractor. CATP-84 2,560 lbs. N/A 92 in. 30 in. 138 in. 7ft. CATP-96 2,810 lbs. N/A 104 in. 30 in. 138 in. 8ft. CATP-108 3,060 lbs. N/A 116 in. 30 in. 138 in. 9ft. CATP-120 3,310 lbs. N/A 128 in. 30 in. 138 in. 10ft. CATP-144 3,560 lbs. N/A 152 in. 30 in. 138 in. 12ft. CATP-168 3,810 lbs. N/A 176 in. 30 in. 138 in. 14ft.